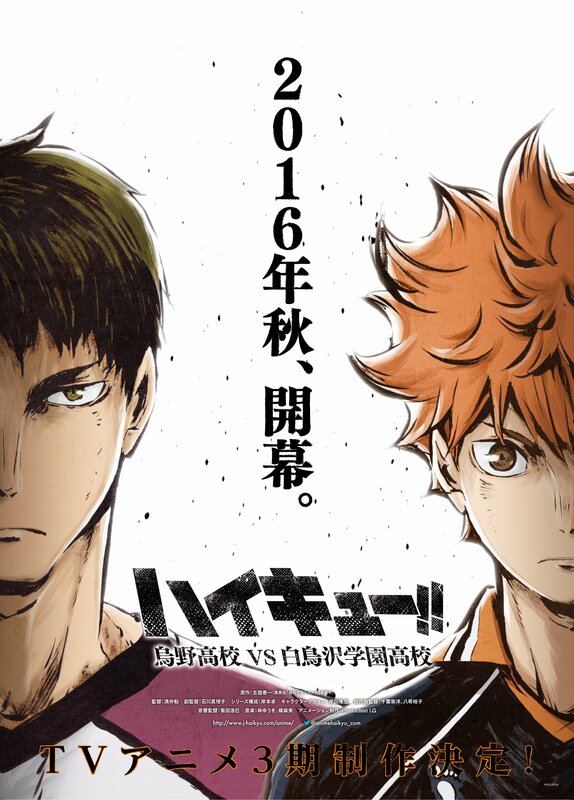 The latest edition of the Shueisha’s Weekly Shonen Jump, 16th issue, reveals that the television anime for Haikyu!! volleyball manga/anime will premiere two compilation movies this falls. The films are titled Haikyu!! Sainō to Sense (Haikyu!! Genius and Sense) and Haikyu!! Concept no Tatakai (Haikyu!! Battle of Concepts). The first movie, Haikyu!! Genius and Sense, will focus on the match between Kurasa High School vs Aobajosai High School which was seen in the first season. The second movie will focus on the match between Kurasa High School vs Shiratorizawa Academy which was shown within the the third and latest season. If you remember, there were previous compilation films previously which were Haikyuu!! Movie 1: Owari to Hajimari and Haikyuu!! Movie 2: Shousha to Haisha. With that mentioned, it seems like these movies will summarise and make the battles between the two a lot shorter but very excited to watch. If this is the sort of thing you like, then it’s coming very soon in the fall.